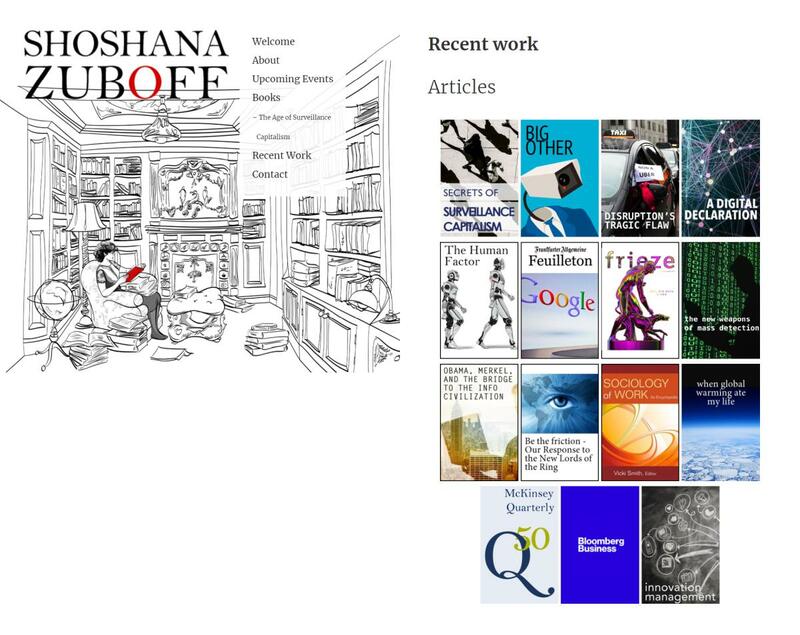 The personal website of Shoshana Zuboff, professor in social psychology at the Harvard Business School, is about as simple and clean as a site can get. The first episode in a series of post in which I highlight and discuss interesting sites from scholars that I come across. Feel free to get inspired for your own site as a scholar! Form a picture in your mind of a scholar in the humanities or social sciences. Chances are that you were picturing her or him in a library, reading books. 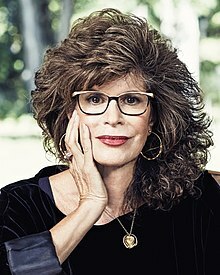 That is what Shoshana Zuboff is doing in the drawing that is prominently featuring on her personal website. The drawing was probably made specifically for her site; Look at the hair of the lady reading and then at this photo of her. She is a true intellectual, a well-read person, her site immediately makes clear. An independent thinker, who is apparently doing her best work in her private library. Or do libraries at Harvard have cosy reading corners like this? It is not just the drawing that stands out, but also how it is used in a somewhat unconventional site layout. The drawing forms the background of a vertical menu. Together they cover half of the screen on desktop computers. Just the right site of the screen moves down when scrolling on longer pages. But there is no need for scrolling here, because the home page is as short and simple as it can get: a short introduction text and the cover of her latest book. That book is what she would like to draw attention to at the moment. Without even a footer and with hardly any color being used in the design, it is a site stripped to the bare essentials. Refreshing in its simplicity. The red ‘O’ in her name and the red book in the drawing are saving the design, I think, from being a bit too plain. Some pages have a different drawing. On the ‘books’ page you see, very appropriately, a pile of books. On the ‘about page‘ you would, similarly, expect a drawing that depicts Shoshana Zuboff herself more prominently. But instead it zooms in on the fireplace in the library, with some decorative artifacts and books lying around. I wonder why that choice was made. The menu has just a few, mostly clearly labeled items, namely pages about (a) Zuboff herself, (b) upcoming events, (c) her books, (d) recent work and (e) contact. What would be a small improvement in user friendliness, is if the menu item corresponding to the active page – the page that you are currently on – would be red. ‘Recent work’ may have been better called ‘Articles, interviews & videos’, because that is what is on that page. 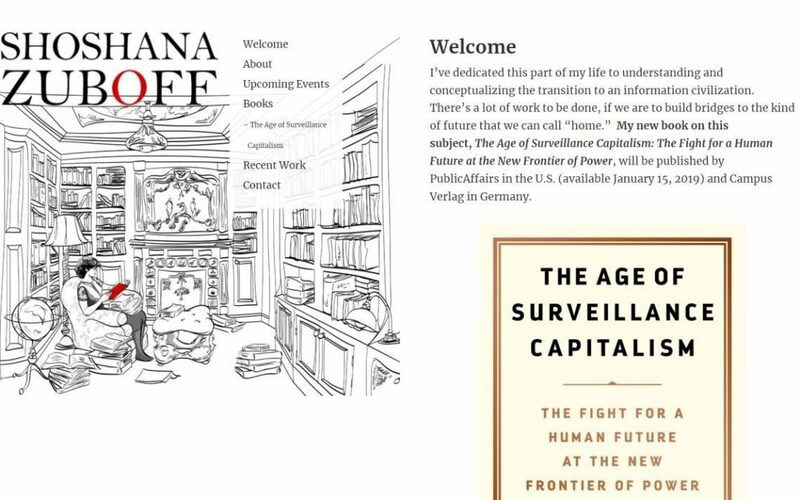 The sub-page on ‘the age of surveillance capitalism’ is a bit of an outlier – I will come back to that at the end of this post. Let’s move on to the pages themselves. The page with her books only features three covers, and refers to the ‘about’ page for more details. This page indeed discusses the three books in turn, but that is not so clear from the text and layout. Included the book cover in the respective page section discussing the book would have made it easier for site visitors to quickly find the info on the book that interests them. Actually, I would have created these pages the other way around: keep the ‘about’ text much shorter and focused on giving an overview of Zuboff’s achievements and career. And refer to the book page for more details on each of the three books. The page with upcoming events displays just a simple list with links to external websites for more details. In contrast, her page with recent work (see screenshot below) attaches each link to an image depicting the topic of the article / interview / video in question. Makes it much more appealing to click through. And the totality of images gives you glimpse of her areas of interests even without reading anything. But if I may make one critical remark: all the links on the page with recent work open in your current browser tab, rather than a new one. That is not a good user experience, one that will cause her to unnecessarily loose site visitors; Most people will not keep hitting the ‘back’ button in the browser to explore more of the articles on her site. Each of these pages should then include not just the book in question, but also articles, interviews and videos connected to that topic. Makes more sense from the perspective of the site visitor, who is generally not interested in a specific content type like articles or videos, but in certain topics. The sub-page on the age of surveillance capitalism actually already makes a start with this type of navigation, but then the idea is not followed through. Are you drawing inspiration from Zuboff’s site? Or do you know other sites from scholars or research projects that you think are particularly nice? Would love to hear about them!